Tucked at one corner of the Mall right next to the Mall road, Hotel Sunflower offers 2-Star amenities. The hotel's offerings and room rates are actually on the higher side of the 2-star range. Although from outside the hotel does not look quite impressive, as you walk in through the main entrance, the inside finishing and ambience is quite nice. The overall interior of the hotel is wood finished. You can see wood paneling all across including on the ceilings. A smart reception counter is on the left. 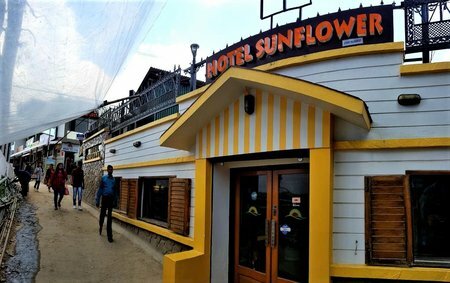 Sunflower hotel was established in the year 1974. The hotel and the rooms have been renovated recently. The hotel has three floors at the lower levels. There are only two rooms at the reception level. All other rooms are in the lower levels. 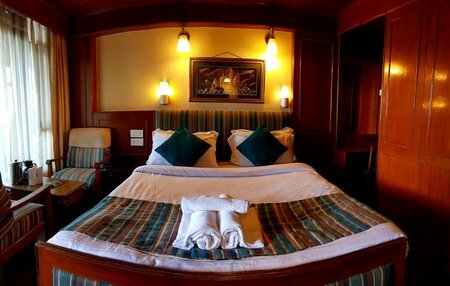 There are a total of 15 rooms in the hotel, out of which 2 are Imperial Executive Rooms, 2 Suites and 11 Double Deluxe Rooms. There is an impressive marbled stairway that leads down to the lower floors. The corridors at all the levels are broad and very impressive offering excellent views through the large window panes. The corridors also have sofas and a small lobby at the end where you can relax. 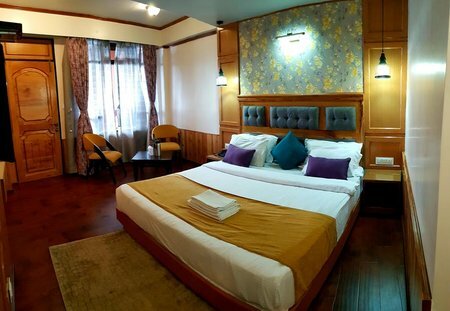 The Double Deluxe rooms are relatively small and compact. However, the rooms are cozy and wooden paneled. There are large wooden cupboards in the rooms. The rooms have queen or twin beds. Other in-room amenities include TVs with satellite channels, wi-fi internet access, room heaters etc. 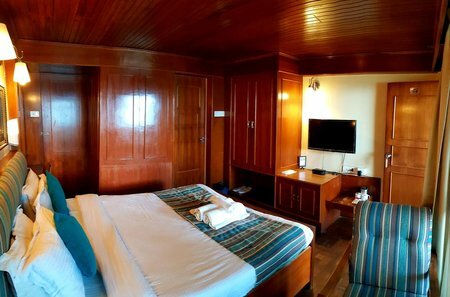 In the double deluxe rooms, there are large sliding windows facing the corridor. When you remove the curtains, you can get the lovely views through the glass panes on the other side of the corridor. The double deluxe rooms otherwise have no separate windows that open out to valley views. There are couple of nice cushioned chairs and a table placed near the window for you to enjoy the view. Imperial Executive Rooms are the best ones. These relatively large rooms have their own windows with great views of the valley. There are only two such rooms in the hotel and they are located on the ground floor (i.e. at the reception level). There are no Mall facing rooms. All the rooms in Sunflower hotel have views of the valley at the backside. Although you won't be able to see the Kanchenjunga snow peaks from any of the rooms, the view of the valley and foothill is great nevertheless. The bathrooms are quite nicely finished as well and have geysers and shower mixers. Hot water is available 24 hours subject to availability of main power supply. The hotel has its own generator that supports the lights and even the television sets. Sunflower Hotel has an in-house vegetarian restaurant located at the reception level. 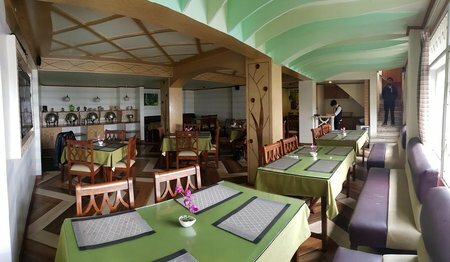 The restaurant has been recently refurbished. It serves breakfast, lunch and dinner. The window-side tables have wonderful views of the valley. The walls are half wood paneled. The ceiling has wooden beams. There are moulded pillars that add to the overall decor of the dining room. Although I have not dined in the restaurant, I received mixed opinions from other guests when I asked about the food. Some mentioned that the food is bland and very ordinary. The others mentioned that they liked the Indian vegetarian food prepared by the restaurant. The rates for the dishes are reasonable though. Other facilities in the hotel includes safety deposit lockers, laundry service, sightseeing, transportation etc. The hotel's key advantage is its location. It's located at corner of the Mall and right next to the Mall road. All the great shops and restaurants are within easy walking distance. The rooms are clean and comfortable. The polished wood finishing provides a cozy and classy touch. The service is reasonably good and prompt. Try to avoid the deluxe rooms at the bottom floor (3 levels below the reception). Every time you want to go out or come to the restaurant, you will need to climb that many stairs to come up to the reception level. The regular rates are on a bit higher side. From the Chowrasta Mall, just before the left Mall road begins, there is a narrow lane next to the Mall road on its left. Hotel Sunflower is located few steps into that lane. It's only yards away from Nathmull's Tea Store and Tibet Art. 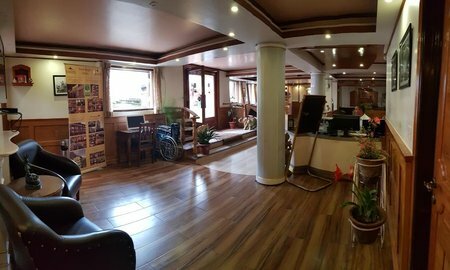 5/C, Chowrasta Mall, Darjeeling 734101, India.